The Surface Pro 4 is the best 2-in-1 PC we’ve ever tested. Update on June 19 2017 9:40AM by Matt Smith: The Surface Pro 4 has been replaced by the Surface Pro, which we’ve reviewed. Microsoft’s new Surface Pro is slightly thinner, has superior battery life, and significantly outperforms the Pro 4 in processor benchmarks. You may still find the Surface Pro 4 for sale, but it should only be purchased at a hefty discount. But the Surface Pro 4 also finds itself competing in an increasingly diverse field. Its revolutionary nature has forced other companies to respond. 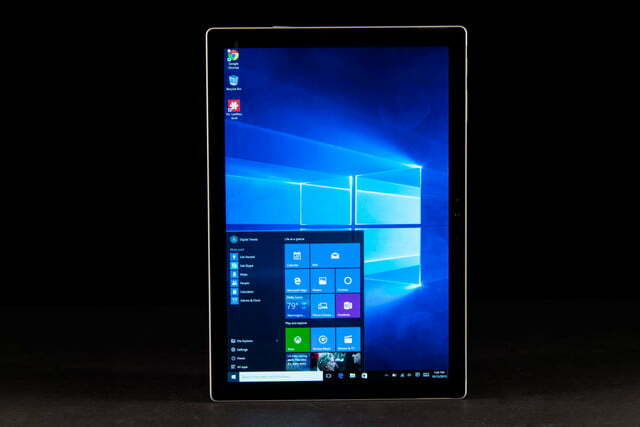 Since its release, the Surface Pro 4 has been constantly imitated, but no updates in almost a year has left the Surface Pro 4 in the shadow of its former prominence. Is it still a solid choice, or should you hold off for an upgrade? The Surface Pro 4 is still bulky for a tablet. Virtually everything based on mobile hardware is thinner and lighter, even the iPad Pro, which has a similar display size. For a PC tablet, though, the Surface Pro 4 is pretty svelte. Whether it’s small enough depends on how you plan to use it, and perhaps even your own dimensions. People who find a regular iPad a bit unwieldy are going to find this massive. We managed alright. More recent competitors like the Samsung TabPro S and Huawei Matebook indisputably feel slimmer in-hand, and are easier to handle. 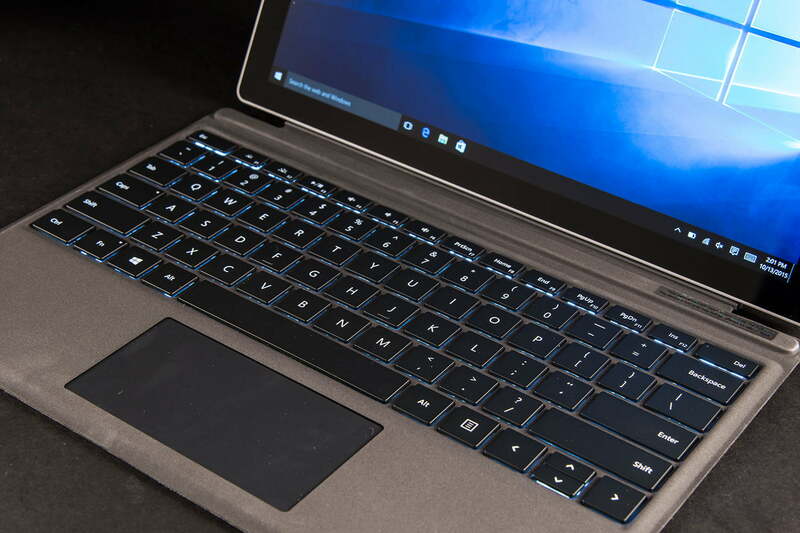 But the Surface Pro 4 is a lot easier to handle than any 2-in-1 with a 360-degree hinge, like Lenovo’s Yoga series, and that’s become the much more common implementation. 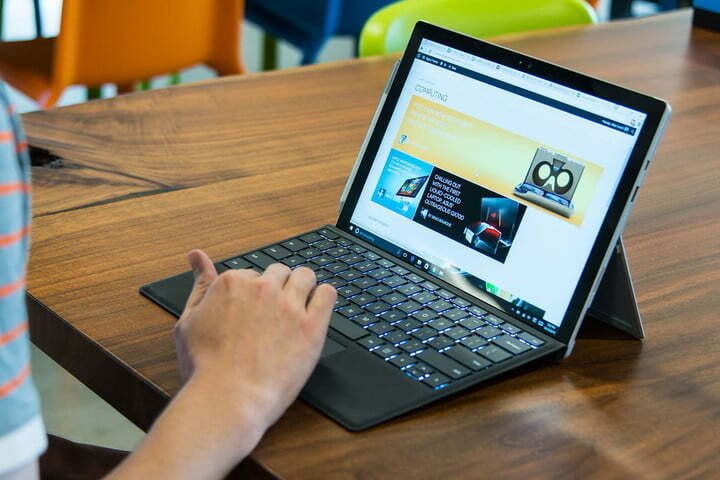 Keyboard quality has long been our most serious issue with the Surface Pro line. Microsoft always used a strange keyboard layout that lacks significant gaps between keys, making it more difficult to discern between them. Previous Type Covers also made poor use of the available space, so both the keyboard and touchpad weren’t as large as they could be. 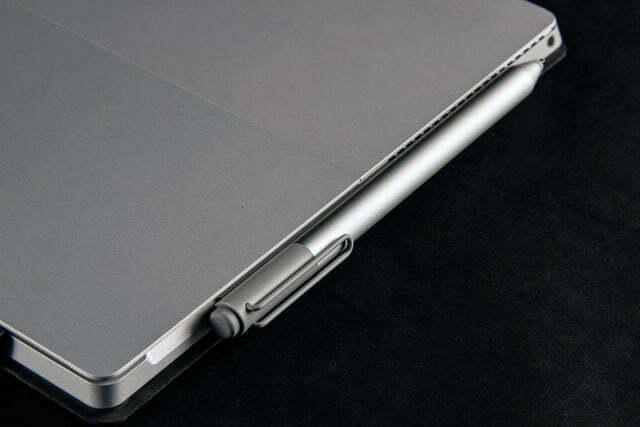 The improved Cover transforms the Surface Pro. 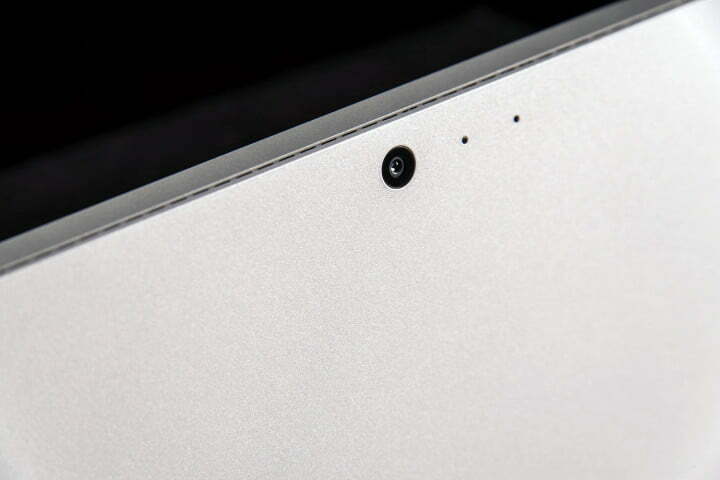 The Pro 3’s cover asked the user to bargain with it. “Okay, kid,” it said, “I’ll give you a touchscreen, but you gotta put up with this keyboard.” The Pro 4 asks no such compromise. It works as well as most dedicated laptops and has a major edge over many competitors including the iPad Pro, Samsung TabPro S, and Huawei Matebook, all of which feel flimsy by comparison. The Lenovo ThinkPad X1 Tablet is the only device we’ve tested that beats the Surface Pro 4’s Type Cover. 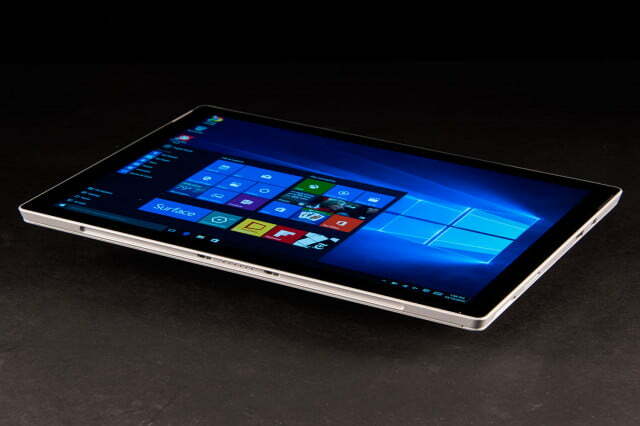 Lenovo’s X1 wins mostly because it’s more comfortable on your lap. 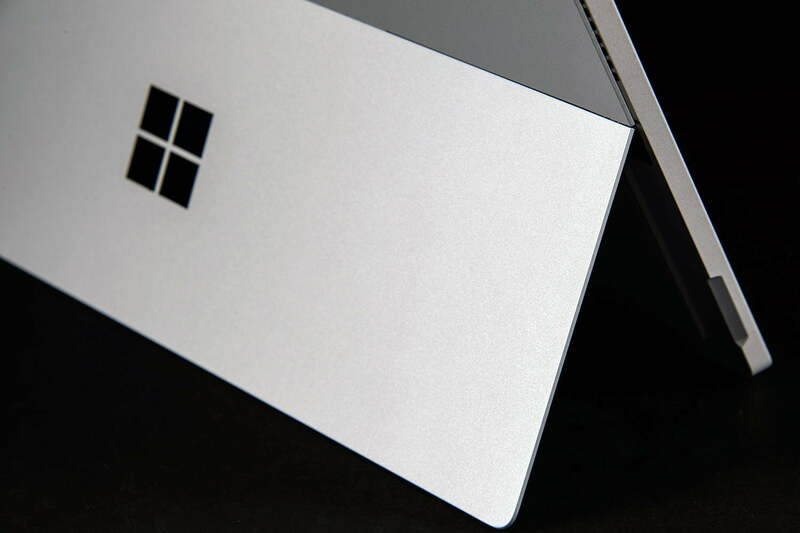 Microsoft’s adjustable hinge needs a flat surface to be stable. That can be a problem if you want to mash the keys while reclining on your sofa to enjoy an episode of Deep Space Nine. 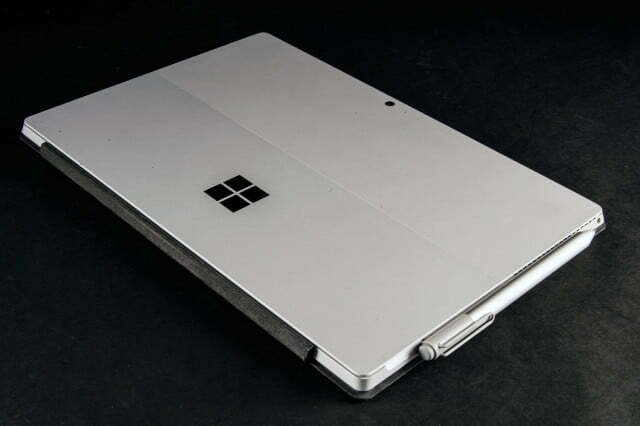 Microsoft contends this issue isn’t a big deal because laptops are actually used on a tablet or desk the majority of the time, and for the most part, that’s true. But it can be annoying – even damaging, as a shift in posture can send the unsteady Pro 4 tumbling off your lap and onto the floor. Some issues do persist. If you stay in Microsoft’s eco-system of apps, like Edge and OneNote, the pen works almost without flaw. Third-party applications are not always as compatible. The Google Chrome browser, for example, absolutely refused to initiate pen input in any of its text entry fields. Slack, an organization app used by companies worldwide, seemed finicky about detecting the pen’s “clicks.” And if you were hoping to play games with touch or pen input, forget about it. Very few are properly designed for it. Still, the Surface Pen is arguably the best in the business. The pen itself is well balanced, feels sturdy, and places its button in locations that are ergonomically comfortable. But what sets it apart from others is that Microsoft doesn’t intend the Surface to be used without the pen (with most competitors, the stylus is an optional add-on). That means Microsoft can aggressively design features that benefit it. Microsoft’s Windows 10 Anniversary Update — the first big update to Windows 10 — is a great example. 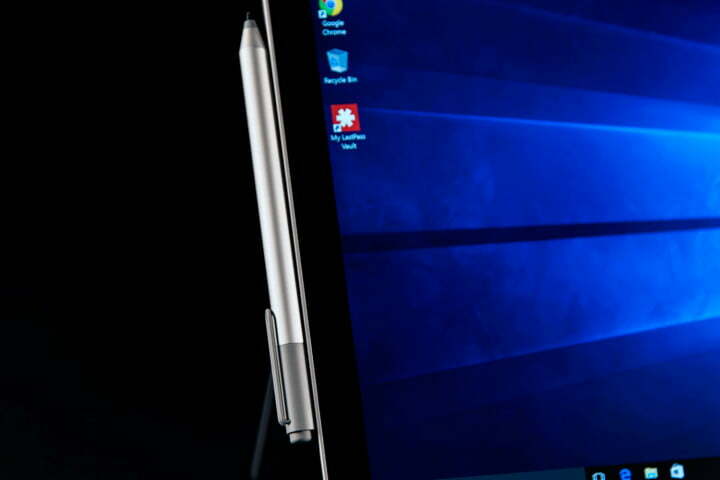 Windows Ink, its headline feature, is all about the pen. 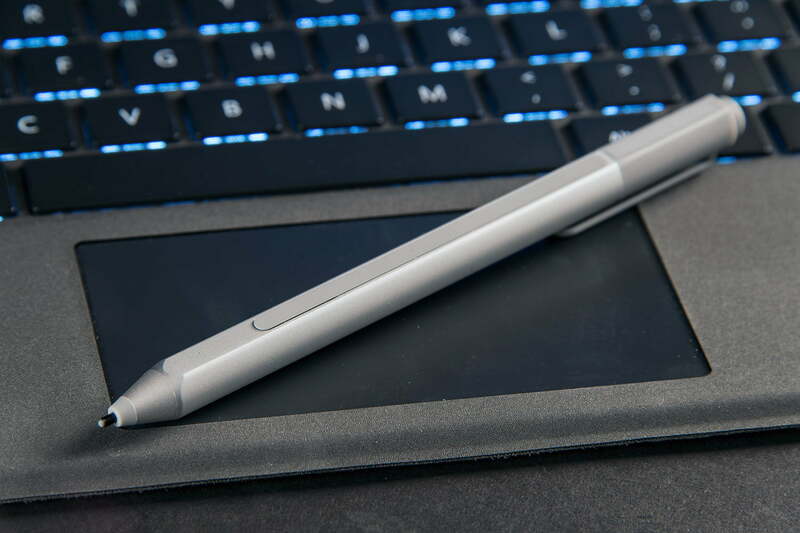 When you’re not using the pen, it can be stowed magnetically on either flank of the Surface Pro 4. We’re still not happy with the security of this approach, as the pen is a bit too easy to knock off. We can imagine plenty of disasters involving errant limbs that send the pen flying into drinks, sewer grates, or food processors. The pen can be clipped in the Type Cover when it’s closed, instead, and that’s the more secure option. The Surface Pro 3’s screen was not a weak point of the device, but Microsoft decided to improve it anyway. Aside from the increase in size from 12 to 12.3 inches, the display has upped its pixel count to 2,736 × 1,824. That’s 267 per inch, which is far more than needed when the Surface is used as a laptop. It’s still not the best in the tablet category, but it beats most, including the iPad Pro. There’s a lot more to the screen than pixel count, and the new Surface nails the details. We recorded a high maximum brightness of 349 lux alongside a maximum contrast ratio of 940:1. 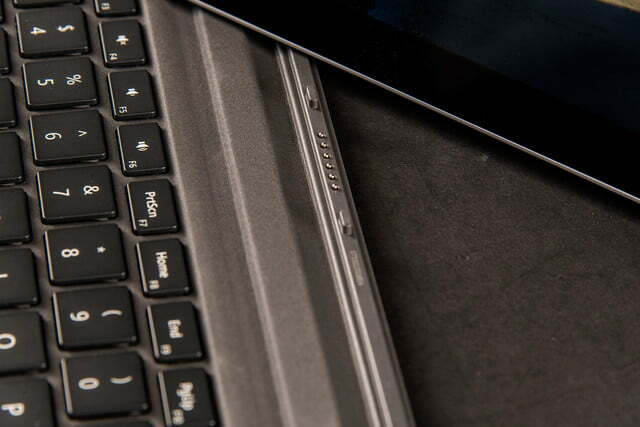 Most figures are among the best we’ve recorded from any laptop, tablet or 2-in-1. Color accuracy was the only soft spot, as the average difference of DeltaE 6.49 was high. All these results are good, but the competition isn’t giving Microsoft an easy time. 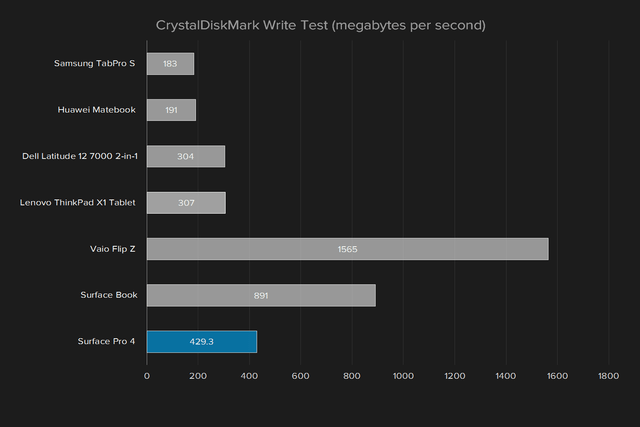 Samsung’s TabPro S is the standout. 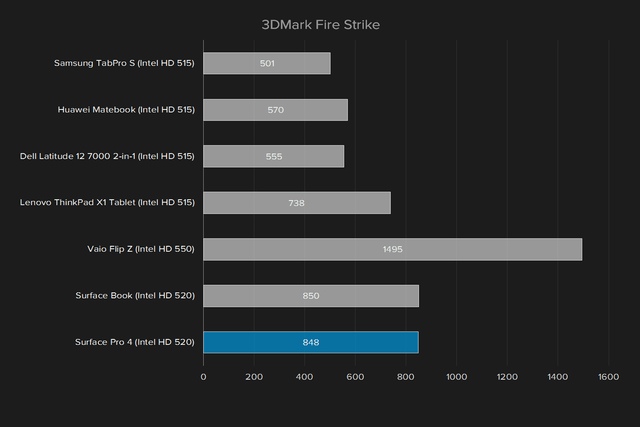 It’s the first 2-in-1 with an OLED display, and its contrast ratio is off the charts. 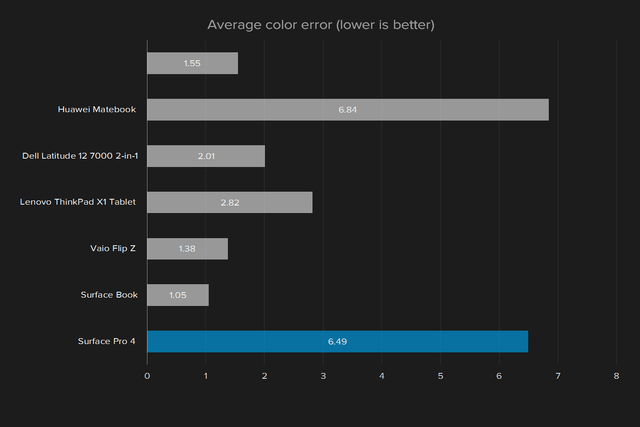 The Dell Latitude 12 7000 Series 2-in-1, Lenovo ThinkPad X1, and Vaio Z Flip also manage to beat the Surface Pro 4 slightly in color gamut, contrast, and overall color accuracy. Our impressions were as expected based off the results. 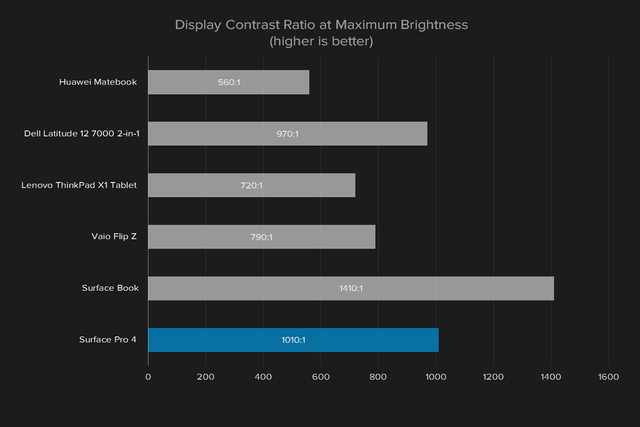 A high contrast ratio should mean the appearance of deep black levels and brilliant whites, and the Surface Pro 4 delivered, creating a sense of depth in movies and images. The color issues made themselves apparent, however, through poor reproduction of skin tones. Actors often looked more like wax figures rather than real people. That said, we’re picky about color, and we doubt most would notice. The Surface Pro 4’s high contrast and pixel density, on the other hand, will be obvious to anyone. The Surface Pro 4 makes several important hardware changes over the Pro 3. It can equip up to 16GB of RAM, instead of 8GB, and the base hard drive now offers 128GB instead of 64GB. Those are nice upgrades. The base model has received an arguable downgrade, however, because it now has a Core m3 processor rather than a Core i3. Whether that’s a downgrade is arguable because the m3 represents a trade-off. The base clock is only 900MHz, and its graphics component is weaker than other Core chips. But battery life may improve as a result of the power-sipping chip. We can’t tell you more than that. Microsoft predictably shipped the mid-range Core i5-6300U pair with 8GB of RAM and a 128GB hard drive. We threw the chip into our benchmarks and found it a strong, if not exceptional, performer. There are clearly two tiers of results here. 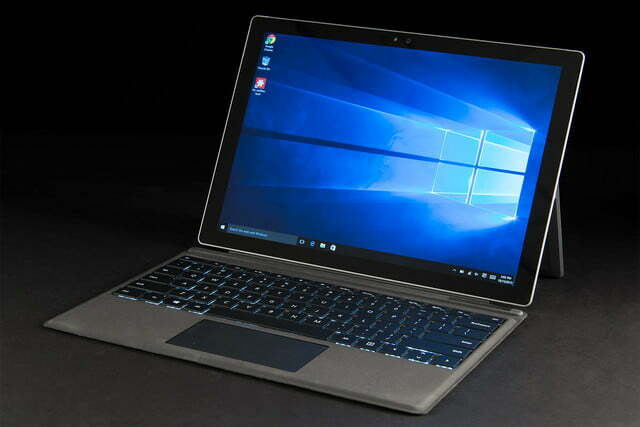 One is represented by the Core i5 and i7 chips in the Surface models, and the Vaio Flip Z. The other, slower tier is shown by the Core m3 and m7 chips in the Lenovo, Huawei, and Samsung. The Lenovo ThinkPad X1 tablet does keep up and even exceed the Surface Pro 4 with Core i5 in the Geekbench and 7-Zip tests. 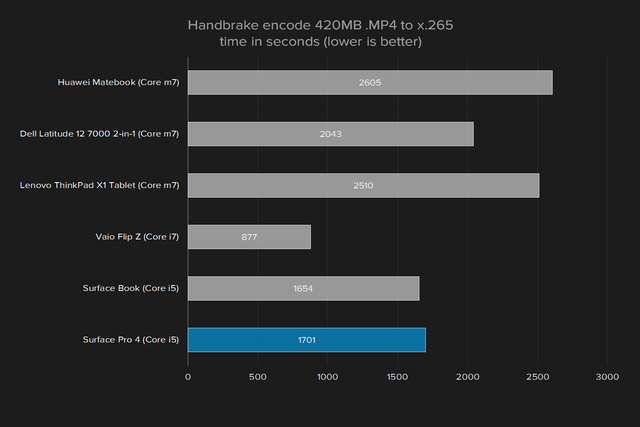 However, the ThinkPad’s weakness is revealed in Handbrake, a sustained video encoding test. 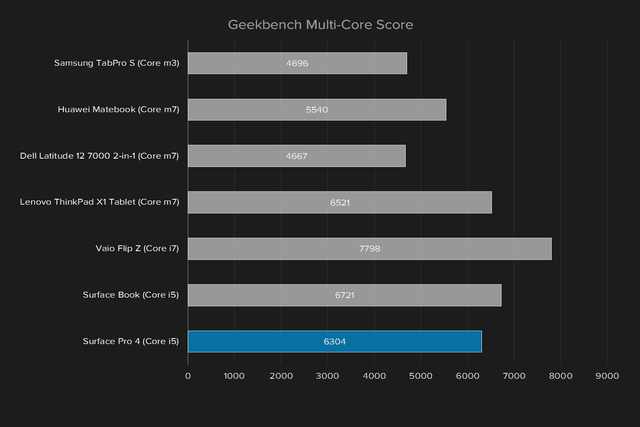 Under that scenario the ThinkPad, along with Huawei’s Matebook, comes up against the limitations of its Core m7 chip, and finishes substantially behind the Surface Pro 4. 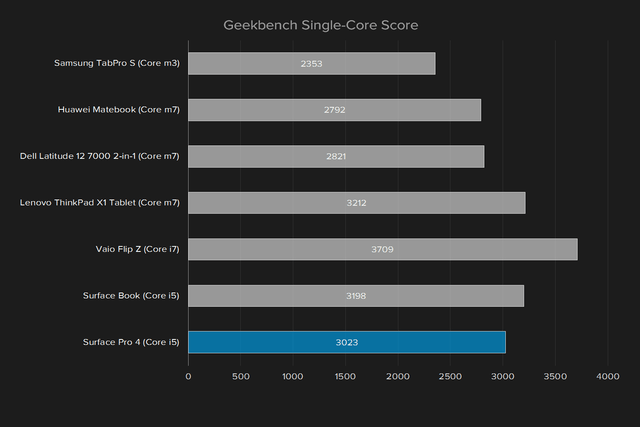 In brief, the Surface Pro 4 with Core i5 performs much like any laptop with the same chip. It’s plenty quick, but doesn’t set any records. 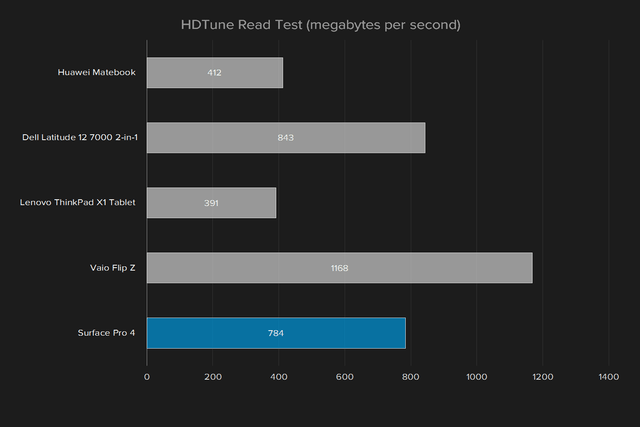 Our Surface Pro 4’s 256GB solid state drive also did well in benchmarks. 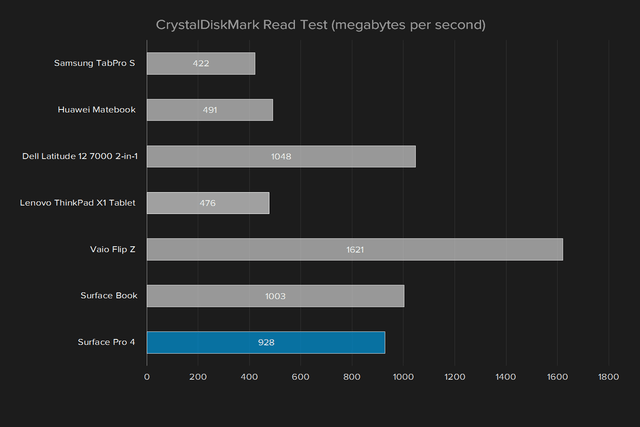 CrystalDiskMark’s sequential test recorded an average read speed of 928 megabytes per second and an average write of 449MB/s. Those figures are not the best we’ve seen, but they’re near the leading edge. 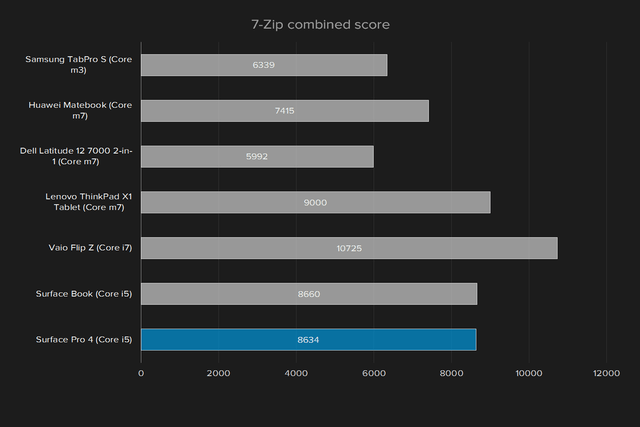 Only the Vaio Flip Z substantially outperformed the Surface Pro 4. Gaming is not something the Surface is built to handle, but it does have the relevant incarnation of Intel’s mainstream mobile graphics, in this case called Intel HD 520. 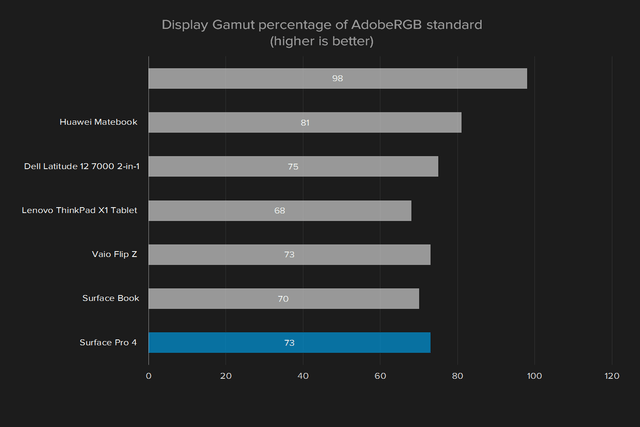 Like the processor itself, the IGP produces respectable but modest results. Once again, the two tiers of performance are visible. The Samsung TabPro S and Huawei Matebook fair badly, and even the Lenovo can’t catch up to the Surface Pro 4. 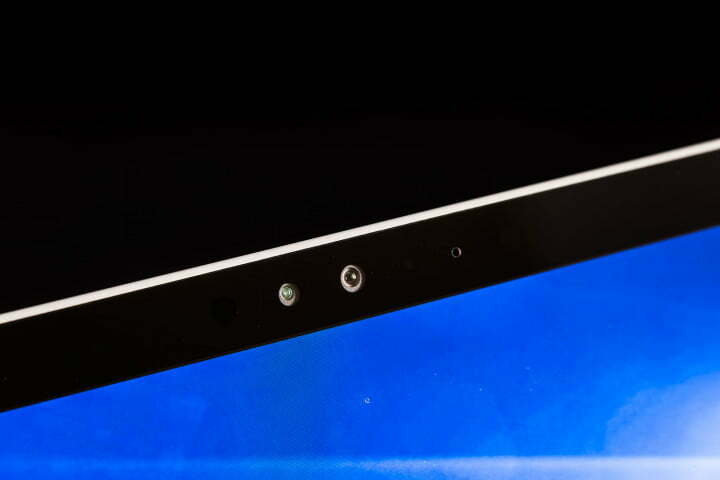 But there’s also a third tier, one the Vaio Flip Z sits claims as its own. Its Core i7 came with Intel’s HD 550, and it proved a big step up from HD 520, delivering a boost of 75 percent. The Surface Pro 4’s integrated graphics can launch most modern games, and will deliver a tolerable experience in some if detail is kept at medium or low. Don’t expect to play any recent titles at high detail, and the most demanding games will be playable only if in-game resolution is reduced to 720p – if they’re playable at all. We had some problems in our real-world tests. In one instance we managed to squeeze six hours and a half using the Peacekeeper browsing benchmark. However, on other occasions we drained the battery in three and a half hours using a simple web browsing and YouTube viewing loop. In any case, the promised nine hours is optimistic, as the Pro 4 fell well short of that in every test scenario. Our subjective experience was the same, as we found the device can’t handle a work day on a single charge. Instead it falls well short, often lasting barely more than half a day. On one short-lived occasion we worked on several open Word documents while also slacking off by watching YouTube videos. That killed an entire charge in under three hours. Many of the Surface Pro 4’s competitors face similar issues. The Peacekeeper web browsing benchmark killed the Huawei Matebook in three hours and nine minutes, while Lenovo’s ThinkPad X1 Tablet lasted just three hours and four minutes. This is one area where the iPad Pro remains the undisputed champion, as it lasted almost nine and a half hours under the same test. Editor’s note: The Surface Pro 4 is no longer the most recent model. 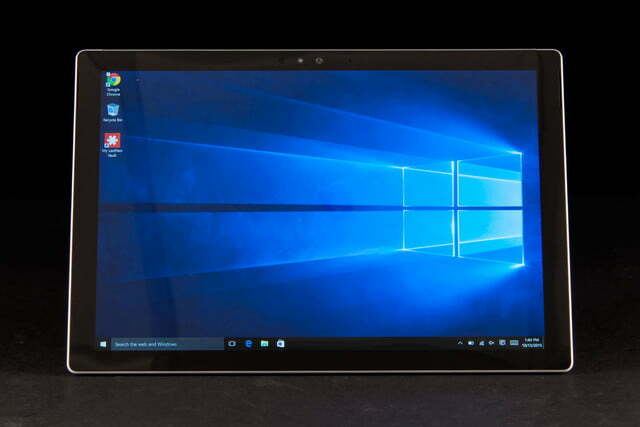 Its successor is the Microsoft Surface Pro, which beats the Pro 4 in battery life, processor performance, and other areas. No one master stroke is responsible. Instead, the Pro has grown through evolution. Numerous bits, from the keyboard to the power charger, have changed little by little. The original Surface Pro had serious flaws. The second and third versions were good, but still demanded compromise. The fourth incarnation overcomes the limitations of its predecessors without sacrificing the core mission. It’s a true do-it-all-device. With that said, no one will call the Pro a bargain. The base model is $800 without the keyboard. Microsoft no longer sells our review unit, but the comparable performance model rings up at $1,200. That’s a lot of money, and anyone looking at the Surface still needs to ask themselves if a single do-it-all device is really needed. It’s also been quite a while without an update, so it should only be under consideration if it’s available at a discount.